Back in the early 1960s, I was lucky to be able to share my youthful musical enthusiasm with a few schoolmates. I say �lucky� because, for one thing, fans of the classics were as thin on the ground then as they seem to be now. For another, we lacked the disposable income of the youth of today. Our LP treasures were relatively hard-won so, once the initial thrill of a new acquisition had worn off, after a dozen or so playings, the disc would do the rounds of our little group. Thus it was that one day, a chum handed me an �Ace of Clubs� record with the admonishment, �Do you want to try this? It sounds a bit, well, modern - but it�s not all that bad, really.� After my regular two hour slog of homework (we didn�t get all that much - I was ever a slow worker), I put it on the turntable of my record player, which was not quite a Dansette, but as near as dammit a Dansette. Three-quarters of an hour later, I was scraping the top of my head off the front-room ceiling, an activity I have undertaken many times since, frequently on account of this composer. No prizes for guessing who but, at the time, I�d never even heard of Sibelius, much less heard any of his music. Well, back then he wasn�t exactly fashionable, was he? Neither was I aware that the recording of the Second Symphony, by the LSO under Anthony Collins, was a classic. Admittedly the field was hardly as crowded as it is now, but it can still hold its head up, even this far down the line. What puzzles me now, more than ever, is how music like this can ever be �out of fashion�. Sibelius is one of those rare composers with an utterly unique - and unmistakable - voice. What amazes me now, more than ever, is how somebody can take the same orchestra of instruments, the same tonal system, the same traditions and conventions, and squeeze out of it all something so �completely different�. If you think of all the �unmistakables� that you can and pile them up, then I�ll guarantee that Sibelius will end up pretty near the top of the pile. What�s his secret? I wish I knew! All I know is that when I see images of snow-encrusted trees, or of glass-still lakes nestling amid glacial mountains, or of clear water bustling beneath fragile ice, or - most of all - when I ponder on Stravinsky�s potent memory of �the (Russian) Spring, which began in an instant, and was like the whole Earth cracking�, some fragment of Sibelius will immediately thread its way through my mind. It also works the other way. As I listen to Sibelius, the music implacably conjures the images. I am sure that I was never taught to connect the two, because my memory of the association predates my knowledge of the composer and his background. I can remember the youthful disdain with which I reacted to the �seafaring� description of the First Symphony on the sleeve of another Collins �Ace of Clubs�. What�s more, I know I�m not alone in this feeling; far from it. This betokens no great perceptiveness on my part, or on the part of anyone else who registers this association. No - it just goes to underline the phenomenal potency of Sibelius�s creations. I would love to know if Sir Colin Davis is amongst our number, because on these recordings he realises the music in a very particular way. It�s as though he were trying to use the LSO to �pull focus� on images, such as I described, cycling round in his own head. We shall of course always be grateful to Karajan for his pioneering stereo recordings, made mostly for DGG, though I do, in particular, recall an LP of the Second Symphony he made for EMI. However, for me Karajan�s failing, albeit a worthy failing, was his obsession with beauty of sound for its own sake. Whilst this served many composers well, it didn�t do a right lot for Sibelius. Half of the time, it is like looking at the snow and ice through a double-glazed window, from the cosy comfort of a fireside chair. Davis, in a manner of speaking, dumps us - inadequately attired - into the midst of all the snow and ice. He compels us, in the words of Offenbach�s gendarmes, to �commune with nature face to face�. You know what? It�s very stimulating - but what�s his formula? I am pretty certain it�s that, instead of treating Sibelius as what my old school-pal called �modern�, Davis treats him as a �classical� composer. Alright, Davis is not alone in this, but where he stands out from the crowd is in the thoroughness and consistency of his interpretative treatment of the music. Pop on any of the CDs in this set, pick a track at random, and without fail abundant evidence blazes from the loudspeakers. I found that I gave up noting it down, because the word �again� was starting to use up too much ink. The key word is �clarity�. Davis homes in like a hawk on clarity, both of line and of articulation. These performances, quite literally, opened my ears to the truly linear nature of Sibelius�s writing. Many examples of what I had formerly thought to be �impressionistic� textures suddenly become the microscopic intertwining and interacting of recognisable threads. Davis�s magical magnifying-glass, enabled by the pin-sharp articulation he asks for - and gets from - the LSO, brings all these fine structures into sharp relief. The textures are still there, of course, the difference being that now you know a lot more about what makes them tick. This is all fine and dandy, but is it dry and academic as a consequence? Far from it. Davis, let�s not forget, has an enviable reputation with the music of the arch-romantic Berlioz. Perhaps it�s no coincidence that Berlioz, when he wasn�t busy blowing the lid off some gothic cathedral with crate-loads of sonic dynamite, displayed a healthy respect for the niceties of the fine line and detailed articulation. It strikes me that, in a sense, Davis is just re-applying the skills he has acquired from his legendary Berlioz performances and recordings. With both composers, Davis seems to adopt the old adage: �Take care of the pennies, and let the pounds take care of themselves�. I choose my adage with cunning! British readers will, if they�re old enough, recall that �pounds� can mean money - or weight. A conductor who takes care of the musical pennies is pretty well destined, without further investment, to get the musical pounds right, because composers build even their weightiest moments by piling up penny-sized details. On the other hand, a conductor who concentrates solely on making an impact will almost certainly make a right hash of the detail. For example, take the start of Sibelius�s First Symphony. After the clarinet�s soliloquy has run its course, the strings enter on a thrilling tremolando. Right? Wrong! Not in this recording, they don�t. Davis elicits a rhythm, apparently embedded within the tremolando. It�s no big deal in itself, but it�s a big enough deal to make your ears prick up, and by the time you�ve heard the set, Davis has made it well worth that small effort. Another thing that quickly becomes apparent is the elasticity Davis brings to the tempi, putting me in mind of Jochum�s famous way with Bruckner. However, Davis is by no means acting on whim: even in this symphony, the scherzo is taken ruler-straight - and at a speed that manages to be exciting without reducing the LSO to garbled gabbling. Yet, in general, the more flexibility Sibelius builds in to his music, using his famous device of �multiplication and division within a set pulse�, the correspondingly less freedom Davis allows himself. This is particularly true of the symphonies but, perhaps surprisingly, in this respect the other works in the set are often handled with relative circumspection. I have long been waiting for someone to make a stereophonic recording that �does� the timps. in this movement the way that Collins did back in the early 1950s. Sadly, I�m still waiting. In compensation, Davis otherwise misses nothing of the craggy grandeur and pastoral stirrings, giving us yet another advantage of his meticulous approach, that of revitalising all the colour inherent in the music. At the end of the symphony, having electrified us in the finale�s central allegro and inspired awe in a massive and majestic reprise of the �big tune�, Davis bids the Earth open and swallow the music whole. This is really impressive. Davis takes a noticeably less �bendy� view of the Second Symphony. He allows the first movement to make its point through the clarity of detail, whilst maintaining a sense of logic amidst the twists and turns of the second movement�s icy blasts and hints of Spring. Taking the scherzo a nadge slower that your average �Flash Harry�, Davis leaves room for the important details to register, stressing the square chords to make the contrast, and wringing tears from the tender trio. The sudden intrusion of the returning scherzo is a bit scrappy, but then I�ve never heard it otherwise. I guess Sibelius must have written it that way? The famous transition to the finale slips by with commendable slickness, but then Davis underlines the cross-rhythms in a superbly-wrought build-up. Neither does he gloss over the lumps and bumps in the accompaniment to the �big tune�, which nevertheless expands gloriously. Again, you can feel his flexibility of tempo, teasing the line, and giving the succeeding string passage a wonderful feeling of arabesque. The long march treads dead steadily. Davis�s approach to the reprise is particularly thrilling: he picks up speed, generating considerable momentum, so that when he applies the brakes a substantial amount of energy translates from kinetic to potential. Such inertial forces need careful handling, and Davis proves no mean rival to Herr Schumacher! Curiously, the final peroration lacks that crucial �take-off� point - there�s no extra �lift�: the music just progresses grandly to its sublime conclusion. Given the context of the set as a whole, I am left with a sneaking feeling that it�s I, not Davis, who has missed something. I really must listen to this one again, and soon. The Third Symphony has been many a conductor�s downfall. I find it puzzling why nobody seems to know how to tackle it convincingly, because in many ways this is Sibelius�s �Spring Symphony�. Emotionally it is the least complicated of all, in particular being relatively free from the dark undercurrents - or even �over-currents�! - of its neighbours. Most of the time the music is - or should be - dancing, dreaming or marching cheerfully with it knapsack on its back. So, somebody please tell me, what is the problem? Sir Colin comes nearer than most to unleashing this happy beast. The strings set off at a teasing trot, soon joined by equally perky woodwind. The first climax, replete with resplendent horns, is hair-raising. A bit later, Davis pares the sound down to the merest whisper and pulls back on the reins, so that the flute entry sounds lost and lonely - neatly complementing the symmetrically-placed passage of halting, timid pizzicati. The second movement�s marking, of �andantino, quasi allegretto�, speaks of the need for a fine balance. Davis hits it dead centre (probably! ), and shades the dynamics a treat. The finale starts off all spick and span. Bending the tempo every which way but �loose� and bringing out the sudden jagged eruptions, Davis gives the music a great feeling of combustibility. In the closing processional, I did wonder if his interpretation of Sibelius�s �allegro (ma non tanto)� might be insufficiently �non tanto�, as his gradual acceleration works up a fair head of steam. However, for all the excitement generated, in the home straight it somehow loses the plot a little. Mind you, it is only �a little� - I suspect that the overall high standard may have cranked up my expectations over much. It is, perhaps, in the grim Fourth Symphony where Davis�s approach comes most directly into opposition with that of Karajan. This is the one symphony where Sibelius stirs his fragmentary ingredients and they don�t, by and large, �gel�. Davis clinically, but far from aridly, exposes the commonality of the first two movements. The first is brooding and, in spite of the increasing activity within the set tempo, static. The second is jolly, bumbling along busily. Both, though, appear disjointed, fractured music that is bewildered by stark brass interjections. Nevertheless there is - has to be - structure, a logical line, and this Davis tracks unerringly. He is equally unerring in the third movement. In his hands �the patient is dead, in spite of the beating of the heart�, which just about sums up how Sibelius must have been feeling at the time. Davis ensures that this persists even through the impassioned climax, which shines like a brilliant spotlight into a black abyss, but then brings out the sun at the start of the finale. Full of bright tinklings and chirrupings, it�s like emerging from the bleakness of winter into the full bloom of snow-melting spring. The almost Ivesian climax, themes clashing and bashing into one another, is articulated with a sure hand, a control that runs just as surely into the final victory of Gloom. Uncompromised by any gratuitous beauty of sound, this performance is a salutary experience. Davis, clear-sighted in the gloom, makes you uncomfortably aware of a soul trying to keep its body together, and not really succeeding. To ensure that nobody, but nobody, mistakes this for unreservedly �sunny� music, Davis emphasises the timpani rolls at the start of the Fifth Symphony. Similarly, following the coiling of the woodwind, the strings are given a juddering impact so that, even before the first big crescendo, it�s obvious that this �ain�t no sunny day�. That ever-present linear clarity brings out the stirring strings, whirring fretfully beneath the slowly turning winds. The key climax is given tremendous weight - and feeling of a weight lifted, with the fanfares of trumpets and horns in the �scherzo� delightfully distanced. Davis�s grip on the inexorable nature of this music is utterly electrifying. He adopts what seems to me to be the �perfect� basic tempo for the dew-dropping ostinato theme of the second movement, where his differentiation of the lines is exceptional. Obviously regarding Sibelius�s tempo marking as implying variability, Davis accelerates into the movement�s climactic core, then decelerates out of it. Is this right? I don�t know. Neither do I care much, because it works! Not for one second are you allowed to imagine that this music is in any way �relaxing�. This makes it all the more curious that Davis �rounds off� the movement with a cadential stress, when it is surely the composer�s intention that it should just stop in mid-flight, as though snipped by scissors. The finale seethes with vitality, expanding energetically through the famous �striding� passage - which is taken strictly �in tempo�. I�m glad Davis didn�t fall into that particular trap. Yet again his meticulous attention to detail surfaces, this time in the changed tone of the whirring strings when they resurface. �Clarity� also etches the image of the coda, as a sheer rock-face with sharp, nasty edges that tear at the flesh. The moment of triumph at the summit is tragically brief: the final chords are hard as nails and sledgehammer brutal. This is a thought-through performance of a very high order. More than once I�ve heard the Sixth described as �euphonious�, and it seems that the music is on the whole sufficiently �non-combative� for an interpretation to carry the opening euphony right through to the end. There are no such shenanigans with Davis. The pin-sharp tip of his baton sees to that, as he uses it to winkle some coy intrusions of ominous discord snuggled in the cushion-cosy opening passage. What�s more, he keeps it that way. Emerging from the first, brief climax, dancing and prancing at a fair old lick, he goes on to elevate the surges of deeper emotive substance inherent in the long brassy notes overlaying the bustle. By the end of the movement, noble horns yield to chill strings. All is tense, expectant, probing - those ominous discords have borne fruit. This symphony sets up a particular challenge through its unusual distribution of tempo markings: �allegro molto moderato�, �allegro moderato�, �poco vivace�, and �allegro molto�. Should the conductor treat these individually, each in the context of its movement, or should he use them to �engineer� a cumulative impression? Knowing Sibelius�s predisposition to playing games with tempo, we�d all (I�m sure) conclude the latter. Quick poll - and no cheating! - can you name me one performance that actually does sit up on its hind legs and bark this at you? Right now, you�re probably expecting me to tell you that Davis provides the �performance that barks�. Sorry folks - he doesn�t! However, he does relate the tempi of all four movements. To be more exact, as near as dammit, he runs a fixed beat right through the symphony. Judicious rubato notwithstanding, he scarcely wavers from this metronomic pulse. If I were to be unkind, I�d say that Davis was just sitting back and letting Sibelius do all the work, but of course there�s more to it than that. Davis, who thus far has shown himself to be ready, willing and able to �bend�, knows just when to hold off. Other than that, he�s firing on all cylinders: his second movement starts from where the first left off, hesitancy giving way to dancing. The music vacillates weirdly between youthful vigour, unsettling oscillations and gloomy impositions. Davis, far from disguising this, leans on these dissonant elements, bringing out the implicit stark, unnerving quality. So it goes on - the third movement�s contrasts are even starker than the second�s, and from the initially stately demeanour of the finale Davis soon whips up a storm. More than anyone I can recall, he brings to the close a feeling of the end looking back at the beginning looking forward. The rising scale that starts the sublime Seventh Symphony also made by ears sit up - there was a distinct offset of the string parts, something that I�d never noticed before. It�s that �clarity� again. Davis�s needle-pointing of the evolving harmony pricks out the pungency of the dissonances. There is a notable mobility which, given the timing of over 22 minutes, says much for his subtle moulding of the pulse in the opening adagio - �leisurely� does not necessarily mean �slow�. Davis is careful to distinguish between the natures of Sibelius�s �seamless transitions� in this and the Sixth. In the Sixth, these are �rigid�, wrought by multiplying or dividing note values within the basic pulse. Here, they are more �plastic�, or even �elastic�. There are a couple of blips. Just after the first majestic climax, for example, there seems to be a little stumble, but nothing much. Davis�s management of the music�s fabric fully realises Sibelius�s ambition to �integrate all the parts�. In his hands, the music really feels like shaded valleys and flashing streams running between vast and awesome crags. It all culminates in the stunning climax that cuts off, leaving the violins stranded aloft with no option but to come back down the ladder ascended at the outset. The coda is marvellously well-forged, almost floating in as the tone swells. The final brass chord is faded down, allowing the violins� leading note to penetrate like a lance of sunlight cleaving mountain summits, then made to grow again to furnish the burnished blaze of sunset fire. Not bad at all. On top of the seven �proper� symphonies we are given a Kullervo Symphony to die for. Never mind that Sibelius the obsessive perfectionist rather lost faith with this youthful extravagance, let�s just be thankful that he didn�t drown it at birth. Although the young composer, still relatively easy meat for his Romantic influences, mixed a rather richer orchestral pudding, Davis cooks it in the same oven he uses for the leaner meat. Taking it at face-value, he draws some sumptuous playing from the LSO and relishes the heady brew, but he doesn�t sink the detail into the plush pile any more than he lingers over-much or pulls the music about wilfully. 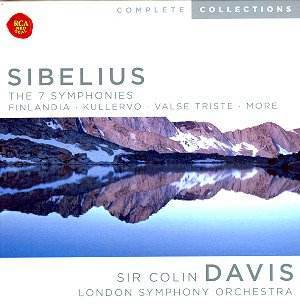 Sibelius�s lines may be less complex and looser, but Davis still gives them all their due. This is not to suggest that he underplays the drama - the first movement coda packs enough wallop to fell an elephant. Equally, he finds plenty of whimsy in and amongst the light-footed marching tread of the second movement, and screws up the menace when required. The third movement is launched at a cracking pace with bags of �snap� - I�d defy anyone to keep their feet still here! The men of the LSO Chorus are mightily impressive, bold as brass, solid as soldiers, lusty of voice, and nigh-on ideally balanced in the sound-field. The pleasantly youthful voices of the two soloists are at first given little more to do than �gabble-recitative�, but later on Hillevi Martinpelto takes full advantage of an extended lyrical passage, her voice blossoming - firm, not too vibrant, and brimming with emotion. The sudden re-entry of the baritone is suitably startling, Karl-Magnus Fredriksson�s voice is all at once bigger, sterner, more powerful and dominating. Both soloists are placed �in front� of the orchestra (big tick), but nowhere near so close that you can feel their breath (even bigger tick!). The remaining two movements are no less effective. Kullervo goes off to war with a spring in his step that even the towering intrusions of heavy brass can�t quite quell, a fine balance between optimism and brute reality that Davis strikes finely! The whirling coda is brilliantly brought off - you�re kept guessing as to which chord is the last. In the finale, the male voice choir reports Kullervo�s death in bone-chilling tones. Davis doesn�t miss the harbinger of genius to come in the evolving agitation of the strings, any more than he underplays the fearsome funeral oration. This set appears under the collective title �Complete Collections�. I�m inclined to wonder, �Collections of what?� Certainly of Sibelius�s symphonies, but it doesn�t stop there. The inclusion of Rakastava as a fill-up merely rounds off five CDs. The set also includes two further well-filled CDs of orchestral works, but they don�t by any means cover all the ground. I would guess, because I haven�t checked, that this set is a �complete collection� of Davis�s RCA recordings. No matter, it makes an excellent �Sibelius starter pack� which for many will serve them a lifetime. I had imagined that Davis, with his Berlioz background, would tackle these symphonic poems and what-have-you with rather more �dramatic� freedom. He doesn�t! He treats each one with the same respect he brings to the symphonies, and using the identical approach. It turns out to be every bit as revealing, making �little symphonies� out of Sibelius�s symphonic dramas. Far from sacrificing dramatic impact, this focus on detail, control and clarity is again the tool that turns on the tap of vitality. Taking as read that these are all top-notch performances, I�ll just give you a few exemplary highlights to convey the flavour. In the Lemminkäinen Suite, the string tremolandi at the opening of Lemminkäinen in Tuonela are truly �shiversome�, with a beautifully-controlled accelerando to admit the �slow� wind line at about the original tempo. Lemminkäinen�s Return is given a terrific sense of expectancy, of latent energy that is released in dynamic surges and detonations. The textures in Pohjola�s Daughter are mouth-watering. The crystal-clear articulation brings some glistening harp and string sounds and accentuates the �weird noises�. Near the end, the return of the brass declamations is underpinned by strings sawing so hard that I suspect the �dark fire� they generate results from a successful application of the �Boy Scout� method! In The Bard, the harp arpeggios are clipped neatly, giving the impression of a lyre. In spite of its purposeful opening, much of Tapiola meanders like the paths of its putative forest. It is stressed and strained, shot through with dislocated, violent eruptions - wild, raw music in which the spectre-ridden rubs against the nightmarish. Davis and the LSO play it simply �like it is�, and it is fearful! In the Valse Triste, perhaps more than in any other Sibelius, management of the �flexible line� is of paramount importance. Whilst adopting a properly slow tempo, Davis makes sure to maintain a pronounced and distinct valse pulse. He holds the pregnant pauses just �so�, bends the tempo, and lets the proper dance episodes flow, rather than whipping them up. Davis�s climax of throbbing passion really throbs. Shades of Hector�s Idée Fixe, maybe? What of the two infamous �warhorses�? Finlandia�s opening brass have great breadth and power, the string phrases full of telling stresses. Prodded by Davis�s sharp, pointy stick, the fast music has a brilliance, urgency and hair-curling excitement that outshines even the legendary HvK - thrust and bounce abound! Davis is careful to keep the Big Tune moving, holding its shape, and it�s all the better for it. On its repeat (violins), I was awakened to a thrumming bass that lent an extra frisson. The longer it goes on, the better it gets - this is right out of the top drawer. The other �warhorse�, the Karelia Suite, brought further revelations to my ears, jaded as they can be through years of familiarity. I�d always thought of the central Ballade as soporific, something of an over-long interlude between the two �good bits�. Davis has changed my mind (you see, it�s never too late to learn!). He has rummaged through the drawers of the score, and come up with all sorts of turning, chattering counterpoints in the accompaniment. As I�ve said, details like these must have been there all the time, sitting in the score just waiting for someone to notice how important they were - and Colin Davis is the kindly soul who has helped them out. How important these details are can be judged by their impact on the music, which is immediately much more mobile and alive. Alright, Davis does take it at andante rather than lento, but so do plenty of others, so I�m sure that isn�t why this �soporific� has suddenly become a �pep-pill�. In the opening Intermezzo, Davis follows Barbirolli in adopting a more measured tempo than is customary. �Measured� it may be, but it�s still quite quick enough if you were actually to march to it. However, unlike Barbirolli who is simply �measured�, Davis fills the elbow-room with a further trove of treasurable details. He also builds resolutely towards the climax, where another reason for the chosen tempo becomes apparent: if it�s taken too quickly, the climax zips by like an over-anxious loss of virginity! This suite to savour is rounded off with one of the most thrilling renditions of the Alla Marcia it�s ever been my joy to behold. I�m almost inclined to say it�s worth the asking price on its own! My one regret is that Davis didn�t see fit to set down the equally energetic Karelia Overture; there would have been plenty of room for it on CD3 or CD5! Speaking of cash, this set is a budget production, working out at around �5 to �6 a CD. Costs have been cut by providing the discs in cardboard sleeves all neatly wrapped in a sturdy-ish box. Having said that, it�s both economical on shelf space and infinitely preferable to those detestable �jewel cases�. The �boast� on the box, that it �contains 108-page booklet�, is somewhat deflated by the qualifying �in English, German and French�, but that still comes to 38 pages per language, which seems pretty fair - and a damned sight better than nothing at all! The uniformly useful English notes are variously by David Wright, Herbert Glass and Karsten Niemann - this last translated into thoroughly idiomatic English by Hugh Keith. Regarding Kullervo, the Bad News is that there are neither texts nor translations, nor even a decent synopsis of the �action�. Still, nowadays you can always chase these things up on the �Net�, n�est-ce pas? I haven�t said over-much about the playing of the LSO. In truth, I don�t need to: across the board, the playing is so unfailingly excellent that it would be unfair of me to single anything out. Suffice it to say that the players, to a man, play their socks off, doing full justice to every last ounce, or 28 grammes, of Davis�s conception of the music. In Kullervo, the soloists are both characterful and eminently listenable, and men�s chorus is nothing short of superb. These recordings were made in four different venues, so it is a credit to the recording engineers to be able to say that it�s hard to distinguish them. Not only that, but they have backed up the conductor�s approach admirably, setting the performers well forward in a warm but not over-reverberant acoustic. There is some judicious �spotlighting� of soloists, but on the whole the impression is of a very natural sound-stage. The actual sound is incisive, with a slight tendency to steely brilliance. This is only occasional, and on some of those occasions I felt convinced that it was actually part and parcel of Davis�s desired effect. That leaves Sir Colin Davis. I feel that his conception of Sibelius�s orchestral music probably deserves the epithet �radical�, as I certainly have not previously come across an approach like it. There�s no denying the dividends paid by treating Sibelius as �classical�: in terms of clarity of texture and articulation of detail Davis must be counted as unparalleled. Added to that he also pushes all the right buttons architecturally and dramatically. Not everything is �perfect� - nobody can be that! - but this is as near as you�re going to get. If you�re new to Sibelius, I can�t think of a better introduction than this. If you�ve known and loved Sibelius for more years than you care to remember, and you haven�t yet encountered these recordings, then you simply must, must put that right.